Fixed impeller or compression pump design: every impeller is fixed to the shaft and is not free to move up and down. Hence, it cannot move without the shaft moving. All the impellers are “compressed” together to make one rigid body. Floating stage design: each impeller in a floater pump is free to move up and down on the shaft within the confines of the diffuser as depicted in the following Figure. The thrust washers on the impeller support the stage thrust. 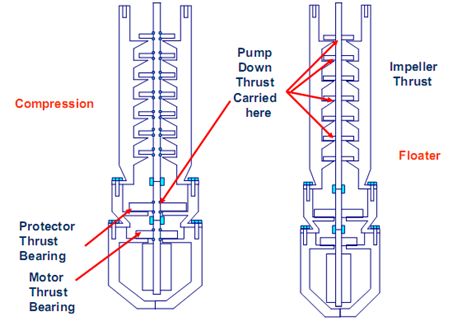 The amount of thrust varies with liquid rate (the amount of fluid being pumped).